So this morning, at the crack of 4:45, I got up, loaded my bike onto the top of our Prius (quite a sight to see), and drove up to Lake Stevens. Crossing Route 2 from Everett to Lake Stevens was kind of an earie sight – the fog was holding really low over the river valley giving it a spooky as dawn was hitting. As I approached Route 2, I started to notice other cars with bikes in or on them… and soon we were a line of athletes making their way to the north side of Lake Stevens. Our goal? To survive the Lake Stevens International distance triathlon in this opressive heat. Helen was the organizer of this whole thing and the swimmer of our group, I was the biker, and John was the runner under our team name “Roamin’ for Naomi.” Joan did the whole thing herself! After I parked the car and went to the transition area, I noted that this was a competetive playing field. Most of the people there were 20 or early 30 somethings. They were buff (for the most part). This competition was a qualifier for a tri in Florida… One of the competitors was a 75 (tomorrow’s her 76th birthday) nun: Sister Madonna: She looked not a day over 50. I.Kid.You.Not. Anyway, my poor creaky little 11-year-old Specialized Allez looked pretty rickety in comparison to some of the up to $5000+ bikes I saw racked up. I was jealous. I knew it was a hilly course from driving it on Friday. My goal was to finish in close to 2 hours, under 2 hours (14mph av), and I’d be happy with anything under that. We won first place in our division (Mixed international distance relay)!!!!!! Helen swam .6 miles in 24:17, I biked 28 really FREEKING hilly miles in 1:42 (average speed 16.3mph). Check out the elevation profile! John did the run in 55:51 – really damn good considering how hot it was by 9:30 when he took off. We got actual winners plaques to prove it! My mom asked me on the way home from the tri why I’m doing all this. I just told her it’s like our bike jerseys say: we live to eat, we bike to eat more. Seriously. I had 5 cookies right after the tri and I really really really didn’t care. They tasted REALLY good. So the only negative was after I did that I had to play softball (my team didn’t have enough women without me)… in 97 degree heat. They have this rule in our league that if you pitch 4 straight balls to a guy and a girl follows, the guy goes to 2nd and the girl gets the option of an automatic walk or to hit. Normally I’d choose to hit. This time I chose to walk (because at this point I was practically falling asleep.). So first the ump looks at me and says “Did you pay for this league?” and I said “yes”, so he tells me I should get my money’s worth and hit. I told him no thank you. So then some A-hole on the other team calls me a CHICKEN from their dugout. I turned, (still with my body markings on my arm and legs) to their dugout and said at the top of my lungs “LET’S SEE HOW CHICKEN YOU ARE WHEN YOU’RE PLAYING AFTER YOU’VE DONE A 28 MILE BIKE RACE IN THE MORNING” And I walked to first. Ruben, Elias, Matthew, (Greg’s) Omar and I went on the Night and Day Challenge http://www.nightanddaychallenge.com/ (a Street Scramble http://www.streetscramble.com/) as the Pastry Powered T(o)uring Machines (although sans jerseys). Greg and Elizabeth did a 7 hour challenge. I had Elias on our trail a bike, Ruben had Omar (who weights more) on our mountain bike with nobby tires. AND I made him carry the backpack. Still with all that handicap, the guy STILL killed me up the hills. There was only 1 hill I couldn’t make it up: the 2nd hill up Madison. Just wayyyy too steep. I did make it up from the water to Lake Washington Blvd, not a bad feat! http://www.gmap-pedometer.com/?r=314159. Turn on the elevation for a good laugh. And then imagine those hills pulling about 70 extra pounds up on a wiggly trail-a-bike. As a first time STPer, I have to say what an amazing experience! I remember biking down 45th ave on my way to the starting point and being struck by just how many cars were stuck in traffic (almost of them with bicycles on their racks) at 5:45 in the morning on a Saturday trying to get to the UW parking lot. I remember during the starting waves seeing all the funky recumbent bikes, like the one where the guy had used PVC piping to build his own customized head rest, the young guy taking off ahead of me riding the Big Wheels tricycle, the father/son tandem cyclists, … just about the only thing I didn’t see were any unicyclists. Fast forward 200 miles later, I must have made a dozen new friends including the ones I met while staying overnight in Centralia, consumed probably more than 50 different food items (including a creamsicle!) and several gallons of electrolyte spiked water, and biked through more than a dozen counties. My favorite part of the whole trip (besides that massage I got at the end of the 1st day was crossing over the Lewis & Clark bridge with a few hundred other people, with all the cars waiting as we passed by, and seeing the “The State of Oregon Welcomes You” right at the top overlooking the Columbia river and then swooping down and around to continue the long march along the river. That alone was worth the price of admission. Short story: We did really well. Kicked some serious bootie if I do say so myself. According to my bike computer, it was 203.79 miles according, but I’m pretty sure I read about 1% low (which also seems to be the problem with Greg’s bike computer), it’s supposed to be 204.5, plus I had a 1+ mile ride to the start. My average according to the bike computer was 15.6 for the whole thing, but a lot of the days were spent around 20mph in pace lines. My GPS lost signal for at least 4 miles in the trees on the trail between Yelm and Tenino. One bummer about GPS. We did the ride in about 12 hours of ride time (about 16 hours of total time start to finish). My max speed was 36mph down one hill (I get nervous I’ll fall off) but I did get to 34.5 on my own power at the bottom of a hill (and zoomed passed Ruben who’s gearing isn’t as good in those situations)). Here’s Lauren and Ruben‘s pictuers (video to come). 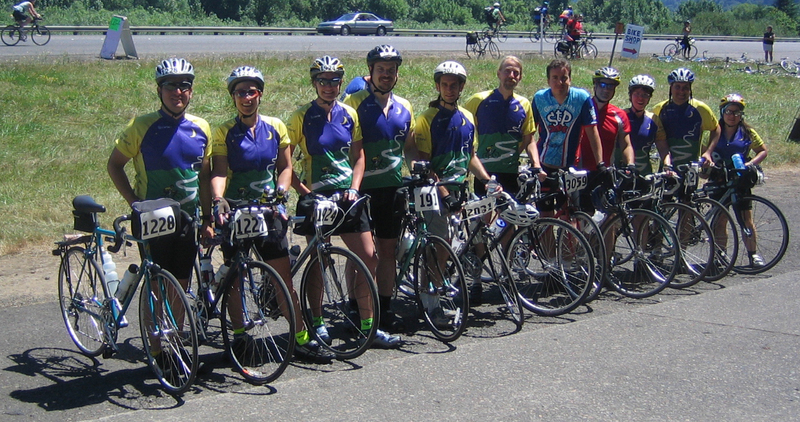 Here’s one of the “team” (minus Greg Barnes (CS grad) who had started early, stayed 20 miles further down the road than us, and finished around noon on the second day). It was fun. I think we’re a little “toasted” (from the sun) and my thighs are a little sore. But most importantly, no injuries (in our team, we saw 2 riders down, but concious, one getting put on a backboard, but who could move her legs) and no flats. We did it! 2 days, 204 miles, 11 people from Seattle to Portland! Lots of pictures and a video forthcoming! Posted on July 17, 2006 Author ErikCategories 191, Cascade, Rides, STP, SupportedLeave a comment on Pastry Powered at STP! So after an hour in Centralia, we rode on 30 minutes to the Acres of Pride Arabian Horse Farm, where we’ll bed down for the night in a RV. We got in, and started eating! Fresh fruit followed by spaghetti and COOKIES! Yum! We made some awesome time. Pacelines are an awesome thing – was cruising at 20 mph and a heartrate of 130. I picked up Joanna about mile 80 and Ruben and Megan caught up to up just before Centralia. Greg is still up ahead, but the 4 of us are leading! Woot! Posted on July 15, 2006 Author ErikCategories 191, Cascade, Rides, STP, SupportedLeave a comment on Made it to Centralia! We’re on the way, mile 54 already! Posted on July 15, 2006 Author ErikCategories 191, Cascade, Rides, STP, SupportedLeave a comment on It’s on!